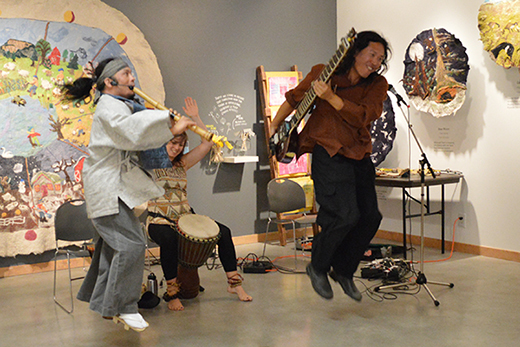 To celebrate this year's annual nationwide Culture Days, ArtStarts and music lovers gathered for exciting workshops with musical trio Dumpsta Dragons. 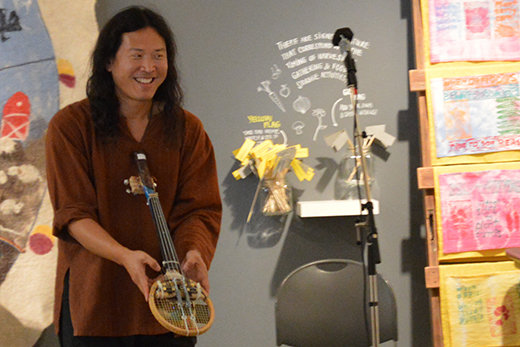 ArtStarts was pleased to present talented musicians Alcvin Ramos, Andrew Kim and Sacha Levin, who brought their many instruments and sounds to captive family audiences at the ArtStarts Gallery in Vancouver and at River Market in New Westminster. Dumpsta Dragons' brilliant workshop showcased instruments that ranged from thousands of years old to recently invented "dumpsta" creations. 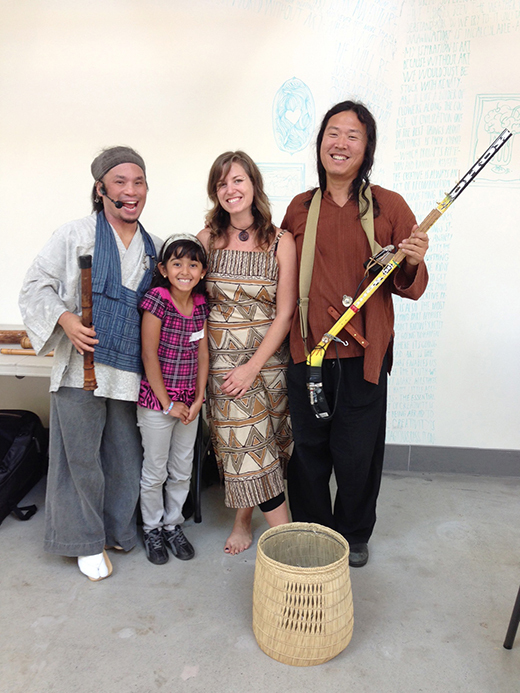 The workshop began with the sounds of traditional Japanese flutes. 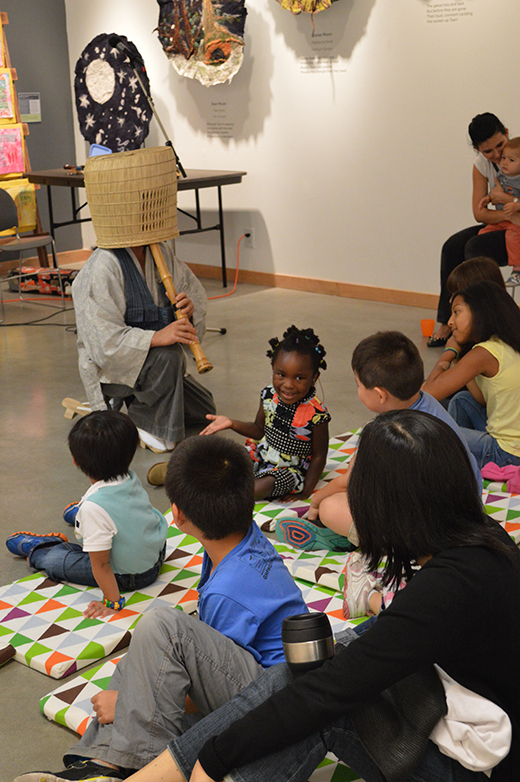 Al encouraged young visitors to listen carefully, and with his shinubue and shakuhachi flutes, he mimicked the sounds of long-necked crane birds, giant waterfalls, and the wind blowing through bamboo. These special Japanese flutes of Zen and meditation remind us that music can be found everywhere if we make time to listen and appreciate the sounds around us. Next, the participants were delighted to hear the sounds of the didgeridoo! This wind instrument developed by indigenous Australians around 150,000 years ago can be used to make several different sounds. Al made dingo bark and growl sounds, and springy sounds to mimic the kangaroo to show a few ways to make sounds with the didgeridoo. After exploring the sounds of Australia, Dumpsta Dragons were ready to being jamming! Sasha and Andrew explained that to create music, musicians often start off with a jam. The most important component for jamming is rhythm. 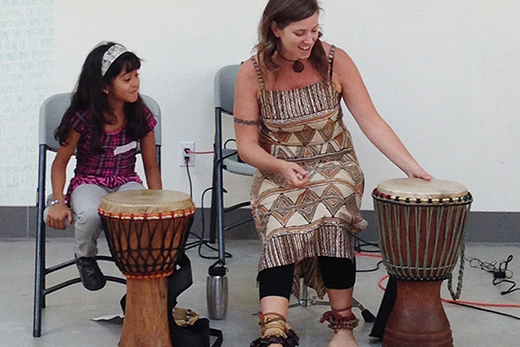 Sasha invited a young participant to try the djembe drum and together they had everyone moving to the beat! Next, it was time to explore Andrew's instruments. He wowed young visitors with his live sitar and kalimba thumb piano performances and further delighted the crowd with his own inventions such as the Moroccan hockey stick guitar and Persian tennis racket guitar. Andrew also demonstrated how to make an instrument from a household or discarded item such as an old wooden spoon. In his travels to India and Africa, Andrew found inspiration in discarded objects, which he manipulated to make instruments. With some rubber tubing for strings and a tiny microphone as a bridge, he created a new "dumpsta" instrument in minutes! Andrew encouraged everyone to think about what kinds of items end up in the garbage that could be repurposed and recycled to make interesting sounding instruments. To end the workshop, participants were invited to partake in some live looping! 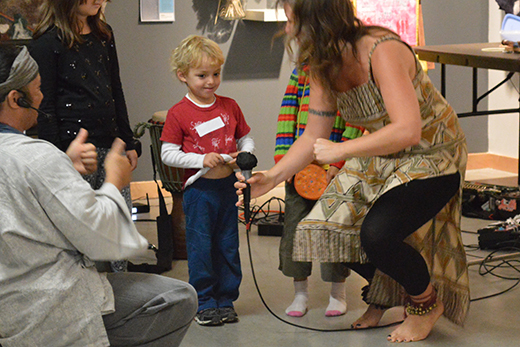 Participants created different sounds overlapping each other on a looper, a device that musicians use to layer sounds. Each time they created a sound, the machine looped the sounds. 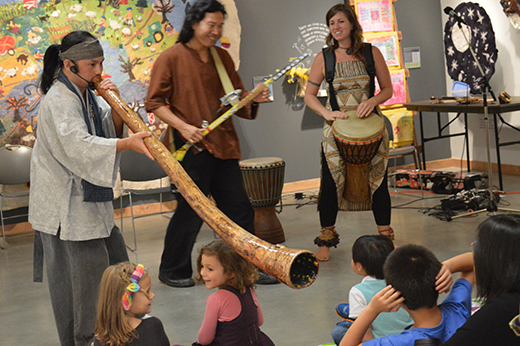 Thanks to Dumpsta Dragons for jamming with ArtStarts, encouraging musical curiosity and reminding us that music is everywhere! As one participant said after the workshop, "There is much music in magic. There is much magic in music." Check out lots more photos on Facebook from ArtStarts on Saturdays and from ArtStarts at River Market. We hope to see you at our next workshops: Painting Magnificent Coastal Forests with Sandi Henrich. Join us at ArtStarts on Saturdays in Vancouver on Saturday, October 25 and at ArtStarts at River Market in New Westminster on Sunday, October 26. While at the ArtStarts Gallery, you'll also catch the opening weekend of our new exhibition, Dwellings: From Seabeds to Cityscapes.